Losing weight requires a lot of hard work and lifestyle changes. Thankfully, in the digital age, a lot of the menial calculations are made easier with the help of useful apps and websites. We’ve discussed the best Android apps for tracking calories 5 Best Android Apps for Tracking Calories 5 Best Android Apps for Tracking Calories If you're looking to keep track of your calories, these Android apps make it super easy. Read More in the food you eat everyday, which let you keep up on your goals no matter where you eat. The basics of losing weight Shed The Pounds: Subscribe To These 4 Weight Loss Subreddits Shed The Pounds: Subscribe To These 4 Weight Loss Subreddits Have you made a resolution to lose a bit of weight? Reddit is a great resource for this, with plenty of subreddits for those eager to reach a healthier weight. Read More come down to ingesting fewer calories and expending more calories. Because you use more energy through staying alive than you do through working out, adjusting what you eat has perhaps more of an effect on weight loss than how active you are. 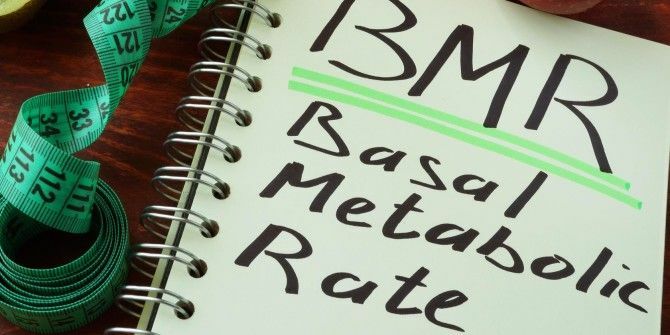 If you’re curious, Calculator.net provides a neat tool to calculate your Basal Metabolic Rate (BMR), or the amount of calories your body uses just staying alive. The general estimate for daily caloric intake is 2,000, which assumes some activity during the day. Your BMR is the number of calories your body would consume powering your vital organs if you were perfectly still all day. For example, a 25-year-old male who weighs 160 pounds and is 5’10” tall consumes about 1,717 calories every day just by living. Add in some light walking around and lifting and that 2,000 estimate is reasonable. Of course, no online tool can exactly account for all the specifics of your body, so take the results with a grain of salt. It’s important to make the calories you do consume are healthy ones! Bought a fitness band for the new year? Check our essential tips for losing weight with one 6 Tips to Finally Lose Weight with a Fitness Band 6 Tips to Finally Lose Weight with a Fitness Band A personal trainer can keep you focused, but it's expensive. Increasingly, people are turning to fitness bands instead. They can monitor your workouts, track your calories, and measure your body's cardio performance. Read More . Did you calculate your BMR? Let us know if you find this useful or interesting down in the comments!